Not that long ago I was asked to run an ice breaker game at the launch of the Swansea Foundation - a new business club. The organizers were keen that The Foundation should have a different kind of ethos - that it should be more of business family - supportive, creative, dynamic and forward thinking and not just another networking group. They asked me to provide an ice breaker to kick-start the party - a gathering of 40 or so local business people, most of whom did not know each other. I used one of my favourite ice breakers to get people interacting and getting to know each other. Within 20 minutes everyone was chatting and having fun. The organiser was so pleased with the ice breaker and said it was the perfect introduction. 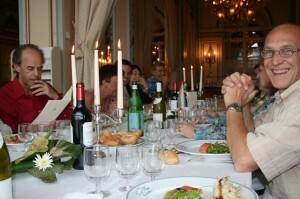 It set the tone of the whole evening - fun,friendly and dynamic. In fact he said it established an ethos for the rest of the Club's meetings and events as we continued to use ice breakers and interactive games and ideas at every meeting. The business club is now a thriving and fun filled place with a booming membership and full participation and enthusiasm from members at every event. 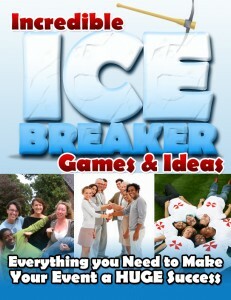 Ensure your clubs and meetings are a fun, friendly and a learning place to be by learning how to use ice breaker games. Visit our web-site ice-breaker-ideas.com and we'll show you how. This year we are celebrating 20 years of providing dynamic & experiential team building events for corporates all over the world and I can reveal that one of our best kept secrets has been the use of carefully thought out ice breaker games to kick-start every event. Whether for corporate meetings, conferences, functions, team building or training, a fun ice breaker game at the start of the event will lighten the atmosphere and help people relax. Icebreakers are great ways for introducing people quickly and breaking down barriers; ice breakers accelerate that "getting to know you phase". Above all if carefully chosen, they are great fun and your group will be in a positive frame of mind for the main event of the day. Quick icebreakers are a valuable tool for every trainer, team leader and party organiser. To get meetings off to a great start ice breakers should be a compulsory item in the tool kit. I'm often asked "have you got a game we could do", and it's always a pleasure to provide one and see people laughing and enjoying taking part. You will need to find some humourous limericks - the web is always a good place to look for these. You will need to print each limerick out and cut into strips. There are 5 lines per limerick and you will need one line of a limerick per person. Your group numbers will not necessarily divide equally by 5 so a few people will have a couple of lines. Mix all the limericks up and hand out a line per person. Ask the group to mingle and try and find the 4 other lines to make up their limerick. Once each limerick has been put together ask the small groups to stay together until all other limericks have been matched. Once everyone has been matched up ask the groups to read out their limericks and congratulate on a job well done. Depending upon numbers this will take around half an hour for 30/40 people. For larger numbers, the task is harder and you may want to number the limerick lines with 1-5 to make it easier.